The Old Opera House in Frankfurt, also known as the Alte Oper Frankfurt is lit up at dusk with its fountain in front in downtown Frankfurt, Hessen, Germany. This historical building is very central in the town and is well worth a visit. The Old Opera House, or Alte Oper Frankfurt lights up at dusk when the sun goes down. The building is clearly lit with a glorious fountain in front, helping to mark this building's presence as an important Frankfurt landmark. It was in the late 1800s that an opera house was first constructed on this site, in a time when going to the opera was not only considered very fashionable, but also afforded the upper classes the chance to catch up with each other, discuss the latest gossip. The opera was an event for which to dress up and it was an exciting event for all. 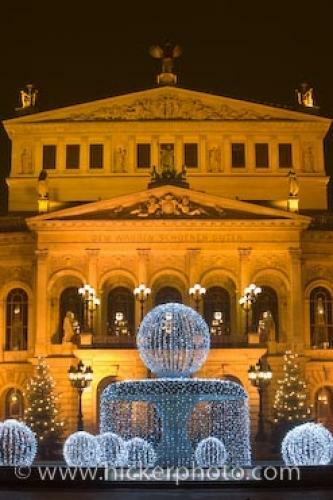 Photo of the Old Opera House, Alte Oper, in the city of Frankfurt, Hessen, Germany. Pictures from photo gallery "Frankfurt Pictures"
This picture is part of the photo album "Frankfurt Pictures" - there are more beautiful images waiting for you. ... In the end the outside was built to look exactly like the original. About 300 concerts and events a year are held in this building, and although going to the opera may not afford the same social status as it once did, it is still quite a magical experience as anyone who has been to one knows. The Old Opera House, Alte Oper Frankfurt, and its fountain decorated with lights at dusk, downtown Frankfurt, Hessen, Germany, Europe. I photographed this photo with the digital SLR camera model Canon EOS-1Ds Mark III, aperture of f/16.0, exposure time of 10/1 sec. on ISO 50, as always I used a original Canon Lens, the focus lenght for this picture was 70mm.